Wokingham Borough Council has started the process to allocate the next phase of housing to be built up to 2036, and the Green Belt of Ruscombe is amongst sites under consideration for major development of some 3500 new homes. This information was leaked in August 2017 when the “Call for Sites” included this land, despite the clear conclusion by the Green Belt Review (commissioned by WBC in 2016) that there should be no change to Green Belt status in the borough. As residents, we have the opportunity to not only object to this use of precious Green Belt land, but to influence the council to build the right homes in the right places for the benefit of local people, many of whom can no longer afford property prices here. The Campaign is in two sections as there are related but separate goals. The Green Belt argument is based on the legal guidelines for this land, so we are working with a top legal team to prevent development here. However of course the next questions is: if not on Green Belt, then where? So the second aim of the campaign is to promote a new approach to planning – the Forward Plan for Wokingham – which addresses the housing needs and obligations in a far more resident-focused way, and will also help to preserve the character of the area and tackle many of the issues – including affordability and traffic – associated with the current large greenfield developments which have dominated recent borough planning. Why is Wokingham’s Green Belt under threat? To prevent neighbouring towns from merging into one another. The report concluded that all of the Wokingham Green Belt parcels “make at least a contribution to one or more Green Belt purposes and no areas have been identified which merit removal from the Green Belt. 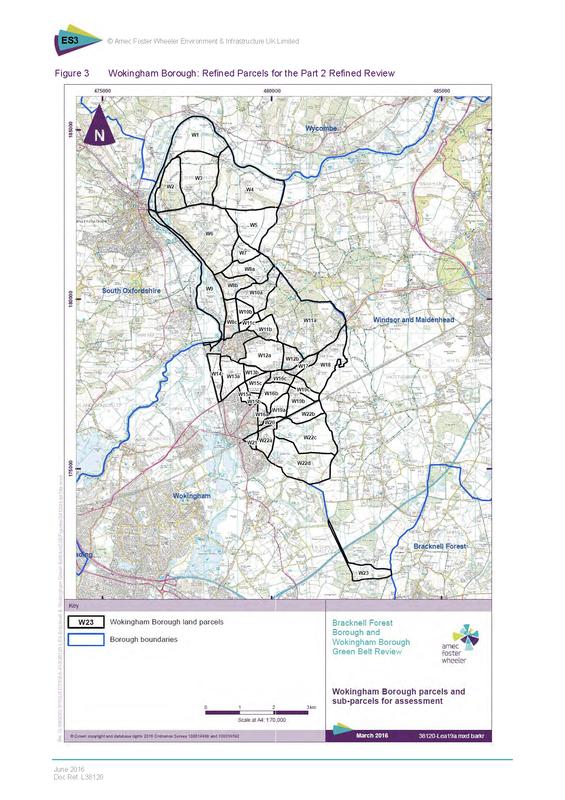 Consideration of any extension to the Green Belt in either Wokingham Borough or Bracknell Forest Borough would need to be considered through a further study.” Eight of the parcels were assessed to make a significant contribution (and none was graded the lowest rank of Green Belt). Green Belts are supposed to be protected from development unless no other options exist (clearly not the case here) and have been publicly supported by the Prime Minister amongst others. Yet WBC has issued a tender to“Master Plan” three major development sites including Ruscombe, which is a costly exercise (£300-500k) and one which they are unlikely to have commissioned without some possibility that the development will be approved. This is why we need to take action now. Where are they planning to build? To fulfil the legal requirement to look at all options for housing land, last year WBC invited people to nominate land for potential development. This ‘call for sites’ resulted in more than 260 pieces of land (sites) being nominated, which could deliver 50,000 homes. These must all be looked at objectively to assess whether they are suitable, available and able to deliver housing and other types of uses, i.e. employment. Housing will not be allowed on all the sites, WBC will only allocate enough sites for housing to meet the OAN (probably 10,500) and in the most suitable and sustainable locations. The sites put forward vary greatly, from those that could accommodate a few homes to larger sites (or clusters of sites) that could accommodate large scale (1000+ homes) if they are considered suitable. All the sites put forward can be found on the Wokingham website or directly via the link below. WBC is currently assessing the 260+ proposed sites, but they have also issued a tender for £300-£500k to master plan the sites in Grazeley for 10,000 Homes, Ruscombe for 3,500 Homes and Barkham for 1,000 Homes; the tone of the tender is inform how to do it and how to overcome any issues around doing it. In Ruscombe, Berkeley Homes and owners Haines Hill are acting in concert and therefore are presenting the Borough with an opportunity of a big site with one developer. It is an easy and lazy option for the Borough to promote and it is being smiled upon. The key point is that Wokingham Borough will have to accommodate more homes in the years up to 2036 but it has not decided yet where these Homes should go. Why are you campaigning to preserve prime agricultural land and green spaces between settlements? As well as the Green Belt there are other key pieces of land which help to preserve the area’s rural history and prevent the towns and villages from merging into each other. Farming is still important here. Allowing the type of ribbon development along the A4 which we’ve seen joining Bracknell to Wokingham would completely change the environment for residents, and we’d become a suburb of Reading/Maidenhead (and possibly eventually London). Haven’t we got enough houses in Wokingham? National Government policy dictates that we must produce a Local Plan that sets out how we will accommodate homes that meet our Objectively Assessed Need, which is likely to be around 850 to 879 homes a year up to 2036. This is a nationally set figure, which we have no influence over. A draft Local Plan that does not plan to meet the OAN will be rejected by the Government Inspector and, without a Local Plan, there will be almost no local control over where or how housing is provided. There is a clear contradiction between the local view that we are over-crowded and the Government’s view that we can accommodate substantially more housing. There is nothing WBC can do to resolve that contradiction. But by carefully planning where the housing is built and what infrastructure comes with it we can protect the high quality of life. And it is worth noting that the Government’s OAN targets are the number of homes. It does not matter whether it is a 25 bedroomed mansion on a hundred acre estate or a small studio flat; it is still a home. What is the 5 year land plan and why is it so important to control it? As well as the requirement to have a Local Plan that will meet the our OAN in the years up to 2036, the Borough Council must also be able to show it has provision set aside for homes to meet a rolling five-year homes target. This means the area must have a steady supply of homes being built, homes being granted planning permission and sites allocated for homes. If the council cannot prove it is meeting its “five-year-land supply”, it becomes very difficult to resist planning applications. However, it must be stressed that the “five-year-land supply” is a misnomer as it is a requirement to demonstrate that there is a provision for sites for homes not the provision of green land on which homes would go. The difficulty of the Council’s position is that the equation for “five-year land supply” is not within its control as it is dependent upon developers’ delivery. Developers are notorious for not delivering particularly on large sites. They do not want to spoil their own market i.e. they have an interest in keeping supply low to keep up prices but there is another added benefit. By keeping delivery low, they also can argue that more sites are needed as Wokingham is not maintaining a five-year land supply and they are winning appeals. There are some 13,500 planning approvals granted not delivered in Wokingham – this is 21 years supply at 650 pa – the last plan number or 15.5 at 875 pa which is likely to be for what we need to plan. This is just land banking. Why is Wokingham so expensive, and don’t developers have to include affordable housing? The high cost of homes in Wokingham Borough is down to simple supply and demand economics: this is a popular place to live so people will pay a lot to live here. But house prices now seem geared towards people who are selling up in London, and this is pricing homes out of the reach of local people. Developers have in three years pushed the selling price for a two-bed terrace house from £250,000 to £389,000. Additionally, the high cost is used by Government as a reason to push up our OAN – its logic being that if supply of housing is increased, prices will decrease. This is dubious unproven logic, and as the rate of housing supply is in the hands of developers they are unlikely to allow this to happen. The national Core Strategy 2010 requires development to have 35% of their homes as affordable. But there is no set benchmark for “affordable” and some developers have avoided the requirement by arguing it would make their development unprofitable. Some provide the quota but often as simply a discount on a hugely inflated price, while others pay WBC the equivalent to provide. We argue that it would be far better for local residents to have both the price and supply controlled by the council, rather than by developers. What about the housing crisis? Don’t we need to build more homes? There is a housing crisis in Britain, but the homes that are currently being built are not addressing it and in many cases – by driving prices up – are actually making it worse. To make a real impact we need to build the right homes in the right places, rather than just building more and more family homes which local people cannot afford. The mix of homes that we are building is skewed towards family homes in large estates. Only 19% of households in the UK have dependents and require family homes. The bulk of homes are being built for incomers to the Borough, who are typically selling homes in London and buying with change a family home in Wokingham. Figures in Reading show that a high proportion of new homes are being bought by people from London. In the meantime, our children, those on median incomes, service workers and older people wishing to downsize are having to leave the Borough for housing. While there will always be people moving in and out of areas this area cannot be expected to accommodate huge amounts of people who can no longer afford to buy in London. We are also suffering a major traffic crisis and a town centre crisis – and our Forward Plan for Wokingham addresses all these. What would happen locally if the Ruscombe site went ahead? Population in the Twyford area would double by 2036. The effect of this will be massive congestion of services and roads leading to a marked deterioration in the quality of life. You will also lose all your green belt and green spaces between settlements. The A4 will become as the Bracknell/Wokingham/Reading Road, completely built up with very few gaps between settlements and effectively becoming a large car park for much of the day affecting Charvil, Sonning, Woodley, Hurst and Wargrave as well as Twyford. Won’t more housing bring more trade? There are those who trade who say more business and people are a good thing, but look at Wokingham. The centre is a desert. People living in housing estates do not shop in town centres but in shopping malls, which are more convenient for parking and access. The Ruscombe development would be the death of Twyford town centre. Won’t Crossrail make a difference? Crossrail is often cited as a reason to develop housing in the area – however, there is a myth about Cross Rail. It is not additional to the current service – it will take over the existing slow line which will go further into London but will stop at every station, much like the underground. To explain: there are four lines going to London – two in and two out. One fast and one slow. Historically the railway has chopped and changed between the two, but now GWR will have dedicated use of the fast lanes and TFL will have dedicated use of the slow lanes (which they currently brand Crossrail, but may change). So if you want to sit on a train, which stops at every station between Reading and Paddington or further, go Crossrail – it will of course be very slow, and the trains will have no toilets so an hour plus journey will be difficult for many, including the elderly. Worth noting too that one of the plan suggestions for the Ruscombe development scheme is to close Twyford station and build a new Parkway station in Ruscombe at a likely cost of more than £100m. How is all this development going to affect traffic ? Traffic congestion locally has reached crisis point, so we cannot keep developing homes in areas which mean that every adult needs a motor vehicle. This is what the last local plan did with four large sites (Strategic Development Locations – SDLs) taking the majority of housing. These huge estates have been built with inadequate parking, and whilst some infrastructure has been built it has been much less than planned which has not included shops thereby ensuring that a car journey is necessary for every requirement of life. We consider the requirement for sustainability should mean that residents should be able to live normally without the need of a car. This is the definition that we should use but we should add a rider in that all new dwellings should have sufficient integral parking or available parking in a nearby multi storey car park to accommodate all their future cars; failure to do so means that Wokingham will be completely devastated by traffic. How can we ensure that we can control the land supply and build the right homes in the right places? As mentioned before, our inability to control the five-year land supply equation means that we are constantly on the back foot. Losing appeals means that we are not in control of delivery. The only way we as a Borough can sensibly gain control of the five-year land supply is to be in control of delivery, which means that the Borough should be the developer. The Council is the biggest landowner in the Borough, none of whose land has yet been included in the call for sites, which it could develop. It could additionally purchase sites to become the developer, as it can borrow money from the Treasury at very competitive interest rates for up to fifty years. What is a genuinely affordable home? And how many should we build? We need to build genuinely affordable homes, not a discount offer on a hugely inflated price. A Rolls Royce Silver Cloud even at a huge discount of 30% would still be unacceptably high. We need to redefine affordable homes as not some predetermined discount from commercial values but a sensible multiple of median income (currently £26K and multiples are four to five times). 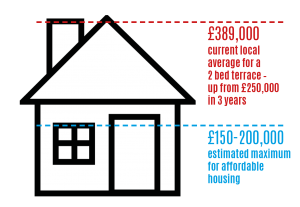 Affordable housing is probably around £150k – £200K. But in the last three years developers locally have increased the price of a two bed terrace from £250,000 to £389,000. We also need to build homes which are within the reach of residents on median incomes to buy and in the £500 – £700 pcm for rent. They are likely to be flats in urban areas within easy walking distance of shops and services. The Campaign to Protect Rural England (CPRE) have analysed the current method that councils use to plan for local housing and what is being built as a result. It finds that ‘housing need’ and ‘housing demand’ are being conflated in planning policy, with the result that sheer numbers matter more than type and tenure of housing. There are some 20,000 homes to be built over the period 2016 – 2036. The majority of these homes should be to retain householders with modest incomes, which may be older people, starters, key workers. Almost everybody doing a median salary job cannot currently live in the Borough. So let us say that one third should be rental properties for £500 – £700 pcm (used to be called council houses), one third starter homes costing £200,000 or less and one third family homes. We have 13,000 planning approvals granted not started, most of which are family homes so that the balance should be entirely council houses or starter homes. This is all the round that we are currently considering. CPRE defines housing ‘need’ as the number of homes required to house local citizens adequately, based on price, size and suitability. We in Wokingham have not had to think in terms of redevelopment as there has been a huge stock of green fields, but green fields are finite. The Borough Council and planners have been lazy and given developers opportunities which they have now become used to. We have even built barriers to redevelopment in our Borough Design Guide with conceptualising every home as a house with a yard and a front door. This is no longer a sustainable model due to pricing. What’s different about the Campaign’s objectives for future housing? Our Future Plan for Wokingham promotes a new way of thinking where the needs of local residents come first, genuinely affordable homes (which an individual on a median income or below can afford to rent or buy) are built in urban areas near shops, services and public transport which will also help to regenerate our town centres through the people who live there. All the new homes should be either council houses or starter homes. They should all be in urban areas where access to services, schools and shops do not require motor vehicles. The parish councils, town councils, borough councillors and land agents should help the Borough discover the sites which could be redeveloped to provide the approximately 8,700 homes in that period. The efforts at lobbying should be entirely to ensure that planning applications granted are taken into account in the “five year land supply” equation.